You don’t need an excuse to organise a party in the company of your favourite people. Press Play to Party sets off party season, our favourite time of year. Now’s the time to go for an outfit that brings together the best looks of the year. Bershka’s Christmas collection radiates bold sophistication with a retro street vibe; where colour, shapes and materials take the starring roles. Pieces are designed to dress up and show yourself off in high-shine, velvet and sequins. We’re back to focusing on the most important trends in fashion and music from the eighties and nineties. Most of the collection is influenced by nineties pop and glitter. Black and metallic tones in crepe fabrics, velvet and the delicate balance between shine and matte bring an undeniably glamorous edge to the most daring pieces. Tailoring has been reinvented with a looser, asymmetrical form; peplums and pleats add an original touch. A key item includes the tuxedo dress, a clear example of the most classic pieces reinvented with a feminine touch. The timeless rocker look is achievable through the eighties biker jacket. Zebra print, tassels and plenty of black are a clear reference to the most emblematic details of rock and punk subcultures. The metallic look invades our wardrobes with rose gold, transporting us to a real disco atmosphere. Now’s the time to go for sequins, pink crushed velvet, embroidery and small patterns. Show off your most feminine silhouette with a series of gauze and tulle pieces with embroidery, floral motifs and light goth touches. “Today everything begins. This is our party and our moment. We’ll transform every corner of the city into a dancefloor. We’ll live an unforgettable experience. 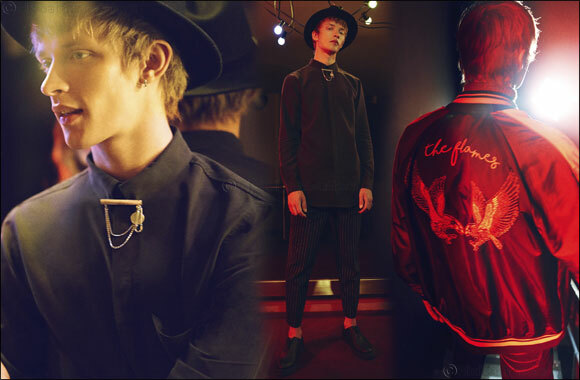 Bershka man offers the coolest designs for classy, urban guys. The combination of tailoring and sportswear is key to achieving a perfect outfit. Comfortable patterns and warm colours are established as wardrobe staples. Burnt orange introduces a dose of quality to the total black look. For outerwear, the tailored woollen coat and bomber jacket stand out in satin textures. Influenced by the luxury trend, embroidery is one of the main Bershka trends this season, adding embellishment to pieces.